At the market, you will have the opportunity to buy gifts for yourself, family and friends. After all, Christmas is coming and it is time to give gifts! If you get hungry or thirsty, I would like to invite you to our Christmas Restaurant with delicious local & international cuisine and different drinks including mulled wine, which will be prepared by using a special recipe. Afterwards, do not forget to visit our Christmas Bakery, where you can enjoy unique sweets, lovingly prepared and donated by my friends from the International Diplomatic Club. BIG THANK YOU to all ladies for their generous baking! And if someone else would like to bake for our Christmas Bakery too, please let me know! But that is not all! A beautiful concert will be organized by musicians and singers from different countries. Among them are the Bicommunal Choir for peace in Cyprus, Windcraft Band, Maronite Community Choir, singers from Sweden, Ukraine, Germany, UK, India, Nepal, and Philippines. You would like to perform at this event please don`t hesitate to contact me! As you can see, it is impossible to miss such an event! As I mentioned before, with lots of joy, surprises and fun! 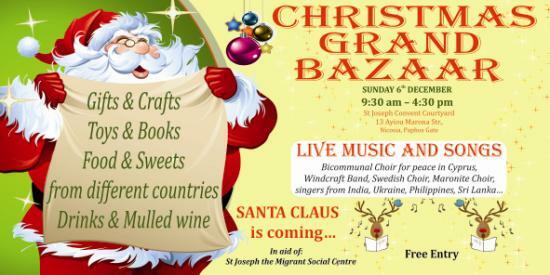 But all this is for a good reason: to support St Joseph the Migrant Social Centre. Over the last two yearsI have been involved in the activities of this center and I can assure you that this center provides tremendous assistance to many needy people in Cyprus, both migrants and locals. And all this hard work is carried out by four amazing Catholic nuns. You will have a unique opportunity to dance with them at this celebration! My dearest friends, come with your families and friends, enjoy this lovely Festivity and be merry!